This oil painting features a romanticized mountain landscape with fir trees and a lake. Ayesha Mirza has used another landscape painting as reference material. Creating an interpretation of another’s work is challenging enough, but the artist is also a beginner in oil painting. The artist has evidenced great technique in mark-making to suggest textures. This can be seen in the smooth blending of the lake; the stippling of brush to suggest the fronds of the fir trees and what appears to be the scraping on of paint via a palette knife (or similar) to suggest icy mountain peaks. These repeating textures create pleasing echoes throughout the painting. Conflicting methods of paint application is a great way of suggesting water, ice, foliage and clouds in a landscape painting. The artist has also created ever muting hues into the distance, to reinforce that sense of depth within the valley. The harsh outlines of the bare tree in the foreground appear stark against the mist in the valley. This contrast between soft and harsh is often used in dramatic landscape paintings to create a sense of distance and grandeur. 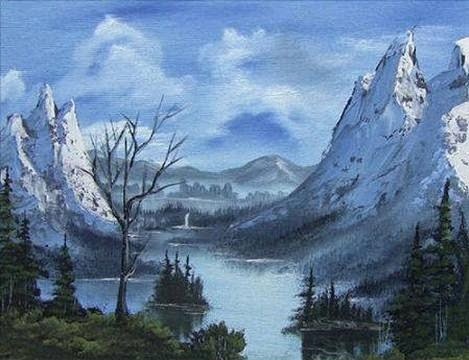 The landscape painting worked from is by Michael Thompson, a style similar to a Bob Ross painting. The original image shows signs of idealization, which suggests a work from memory or a formula, rather than an actual landscape scene. The mountains are conical, the fir trees are regular in formation with uniform greens, and the sky, a patchy ultramarine-type blue with white. An actual landscape has somewhat a different feel to a romanticized landscape as can be seen in the photos below. Unexpected surprises can often be found, such as mountains like tissue paper, orange in fir trees, clouds like herring bones and pristine reflections. These elements are not always found within a formulaic landscape painting. It is often true a painting can only be as good as the photograph or painting worked from. If the artist is interested in copying another’s work, I would suggest snow paintings of the great artists, such as the Impressionists or breathtaking photos such as these. Plenty more can be found copyright free in the Net. Copying from a photo gives the artist more free reign than copying a formulaic landscape painting, such as one by Thompson. Ayesha's great ability to suggest textures in landscape lends itself to working from dramatic photos. A convincing landscape painting with atmosphere is certain to result. The artist can explore dazzling blues that can be found in snow (achieved by the mixture of cerulean and ultramarine with a little white). Or pristine creams in sunlit snow (achieved with white with a little cadmium yellow or burnt sienna). Shadows in mountains will often possess opposing colors to the sunlit side (such as pink against violet, or orange against blue. 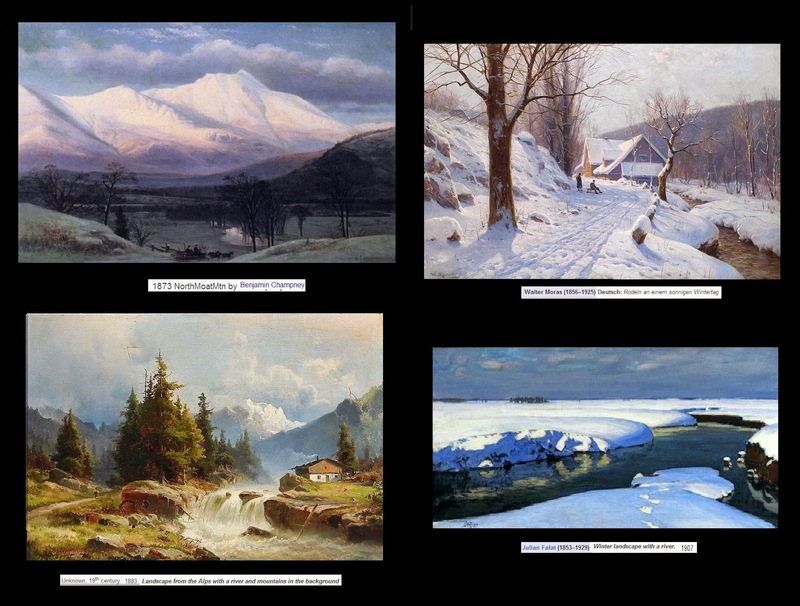 Soft violets and creams in snow can be seen in the four paintings below. Ayesha’s oil painting appears to be worked from a stylized image of an Alpine scene. I feel that such reference material can be quite limiting for anyone who wishes to explore the truth in nature. A photograph of an actual landscape scene I feel is the way forward. The artist can then explore the bizarre nature of a grand landscape without limitations and create a personal interpretation of what is seen. Oil colors I would recommend for copying any of these images are: titanium white, cerulean blue, ultramarine, burnt sienna, burnt umber, cadmium red, cadmium yellow (pale) and viridian. These colors will enable the artist to broaden the palette and achieve high contrasts in light and dark. Ayesha’s lovely textural techniques will complement compelling landscape paintings. Further, using glazing technique (the application of thin paint) for water and skies will contrast against impasto (thick paint) for trees and snow. Fine sables will be needed for sharp detail in mountains, and harsh bristles will come in useful for scudding clouds. A palette knife is great for scraping on the paint to suggest icy peaks (as already evidenced). 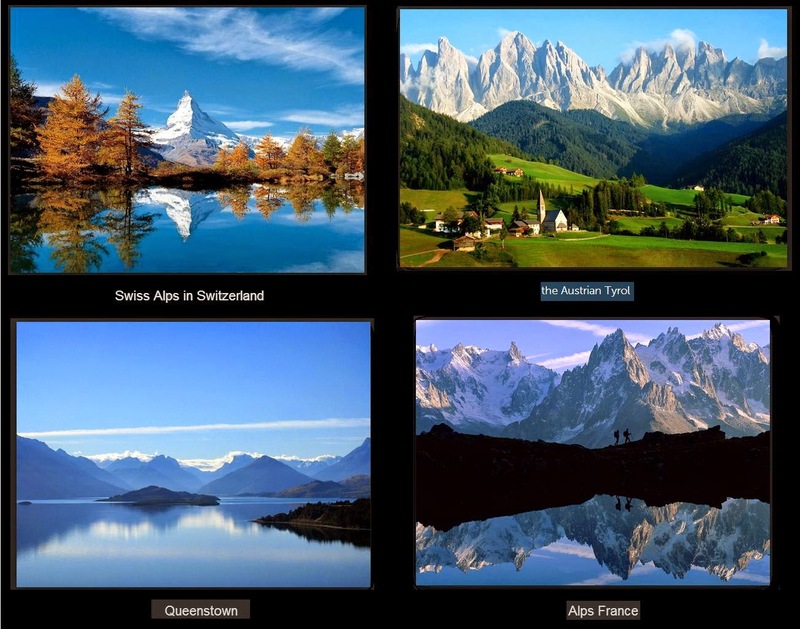 Above all, a good photo to work from is more likely to create a compelling landscape, including an Alpine scene. 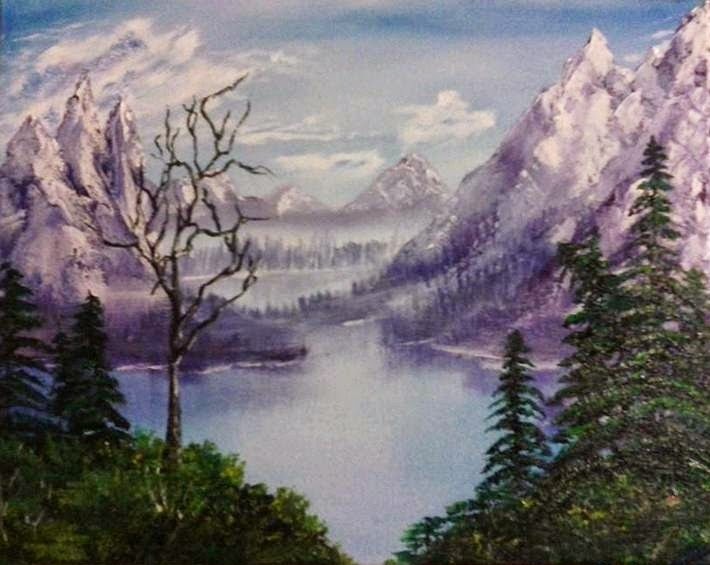 In-depth tips on painting mountains, water and trees can be found on the links below. How do I darken the color of snow?